Inherent VMware NSX network isolation and segmentation makes data center micro-segmentation feasible without the need to configure vLANs, ACLs, firewall rules, physical firewalls and routers. With Check Point vSEC, a layered approach to policy management allows administrators to segment a single policy into sub-policies for granular rule definitions and delegation of duties by network segment. This ensures that the right level of protection is applied across each network segment. The VMware NSX network hypervisor is optimally located between the application and the physical infrastructure, enabling distributed enforcement at every virtual interface. By integrating with VMware NSX, Check Point vSEC can dynamically insert advanced security protection. Check Point’s Advanced Threat Prevention delivers multi-layered defenses, with the industry’s best catch rates and comprehensive threat intelligence, to proactively stop botnets, targeted attacks, advanced persistent threats and zero-day attacks. VMware NSX makes it possible to chain Check Point’s advanced security protections between different workloads and to control communications between applications. This reduces network complexity and the need to use multiple VLANs inside the data center. Security management is simplified with centralized configuration and monitoring of virtual security gateways. Virtual workload traffic is logged and can be easily viewed within the same dashboard as other gateway logs. Security reports specific to virtual workload traffic can be generated to track security compliance across the virtual network. VMware NSX standard tags enable full-context sharing between VMware NSX, VMware vCenter and the Check Point vSEC management platforms ensures that VMware Security Groups and VM identities are easily imported and reused within the Check Point security policy. This reduces security policy creation time from minutes to seconds. Context-awareness is maintained so that any changes or new additions are automatically tracked. This makes it possible for security protections to be enforced on virtual applications regardless of where they are created or located. In addition, predefined Check Point security templates automate the security of newly provisioned VMs. Check Point vSEC leverages VMware NSX security automation for dynamic distribution and orchestration of vSEC for protecting East-West traffic. 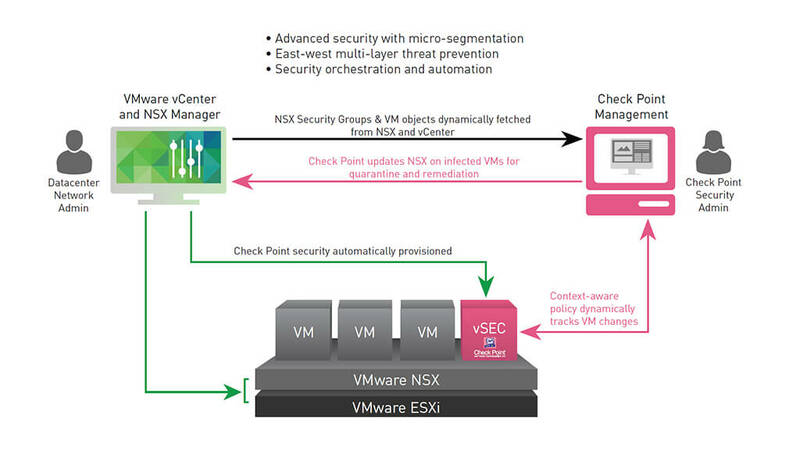 Check Point vSEC detects and tags malware-infected VMs, and automatically updates VMware NSX. Threats are quickly contained and the appropriate remediation service can be applied to the infected VM. In the data center environment, there is often a need to integrate different systems that manage the security workflow. Also, repetitive manual tasks must be automated to streamline security operations. Check Point’s security management API allows for granular privilege controls, so that edit privileges can be scoped down to a specific rule or object within the policy, restricting what an automated task or integration can access and change. This ability to perform trusted connections provides security teams with the confidence to automate and streamline the entire security workflow.